Forest Whitaker arrives at the Marvel Studios' "Black Panther" Los Angeles Premiere held at The Dolby Theatre in Hollywood, Calif. on Monday, Jan. 29, 2018. The last time Oscar-winner Forest Whitaker had a supposed huge role in a big Disney blockbuster as terrorist and father figure Saw Gerrera – 2016's "Rogue One" – most of his scenes were left on the cutting room floor. This left many fans disappointed, as trailers clearly indicated a big role for the legend as the mentor for lead character Jyn Erso. 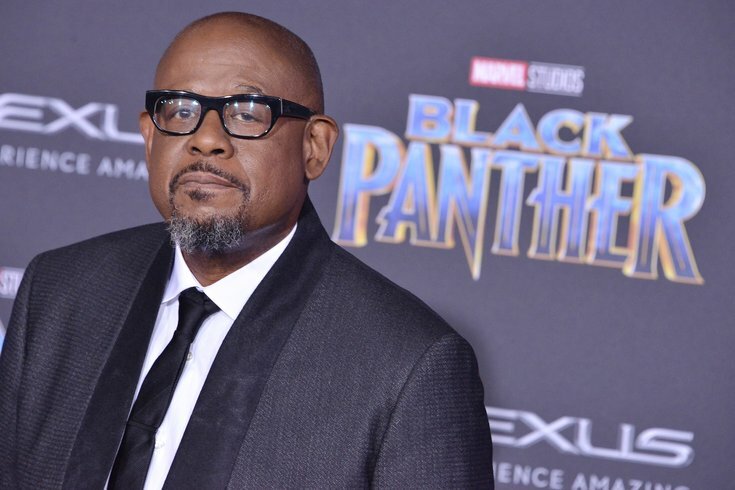 "I think they made a decision to change the director," Whitaker said during an exclusive interview with PhillyVoice about his role in the new Disney Marvel Comics film, "Black Panther." "There was a lot of reshooting and other things and stuff like that." However, it is clear that Whitaker gets significant screen time as a confidant to T'Challa, the recently crowned Panther and one of the land of Wakanda's greatest warriors. This makes Whitaker quite happy, because although he is best known for realistic dramas and epics like "Platoon," "The Butler," and his Academy award-winning role in "The Last King of Scotland," he feels sci-fi and superhero films like "Black Panther" can have even more an impact because they are seen by more people and can get people thinking about issues in different ways. "Wakanda is a very traditional country," he said. "It stands for different things to different people. The great thing is the people are all speaking differently and the world is nothing you've ever seen before. You're able to explore issues in the safety of something. "That's what happens in science-fiction dramas, too. We're always exploring issues and what they do to society itself...But the safety of a 'Star Trek' world or a 'Star Wars' world or Wakanda is it offers you a little bit of difference...It's a universe we've never seen – and it's because Ryan [Coogler, the film's director] made it so full, and each part seems to fit into the other, so you don't question it. You just accept as something that exists and just is." Whitaker said he thought it was "powerful" the way the film dealt with Michael B. Jordan's Killmonger character, who is being almost universally praised as one of the best villains to ever hit the screen. "They didn't demonize him. They recognized him as someone who had been wounded," he said. "Here's someone who was a prince, really – who could have been king! But he was treated differently, as so many young men in our country right now who are having a void of choices and are being persecuted and profiled and all kinds of things, and you somehow expect them to take all that oppression and express it in a suppressive way. "Again, that's one of the conflicts and tragedies of the movie," Whitaker continued. "He could have been king, but it wasn't that way...The fact that they put these kinds of images in the film is a powerful statement [to] the film itself." Whitaker said he was was also pleased that "Black Panther" didn't exclude anyone in the audience by making all the black people good and all the white people evil. "This film isn't that simplistic," he said. "It explores big, deep things – like what it means to step out and risk yourself a little bit, so you can go save the Earth. It's interesting that most of the fighting is amongst themselves. "I think the movie is trying to tell people to take a risk, because many of the people of Wakanda have become comfortable. They're doing that because they want to help their community, their environment, and their world." One of the things Whitaker hopes people take away from the film is a better understanding and appreciation of Africa. He said many Americans and westerners remain ignorant about the continent. For one example, while some would argue President George W. Bush is still not extremely popular in the U.S., when he visits Africa, he is loved. Though Whitaker was a supporter of President Barack Obama, he said he wishes our media would focus more on these kinds of things versus what the outrage of the day is. "[Bush] really saved millions of people from malaria," said Whitaker. "He got the rate down to virtually nothing. He did some amazing things." Before ending the interview, Whitaker wanted to express how amazed he was at the cast he got to work with on "Black Panther," including Angela Bassett, who he calls an "icon;" Oscar-winner Lupita Nyong'o; Jordan; Chadwick Boseman; Daniel Kaluuya, who is nominated for an Oscar this year; breakout star Letitia Wright; Winston Duke; Andy Serkis; and Martin Freeman. "I don't know if I could have expected them all in this universe," he said. "I think one of the most beautiful things of all this is I get to work with all these different artists." "Of course, I didn't get to work with all of them as much as I'd like," he concluded. "That's the only thing about this movie that would have made it greater for me. But I did get to work with Chadwick and with his work as the Panther. I already realize what a great actor he is and why he's already accomplished so much."